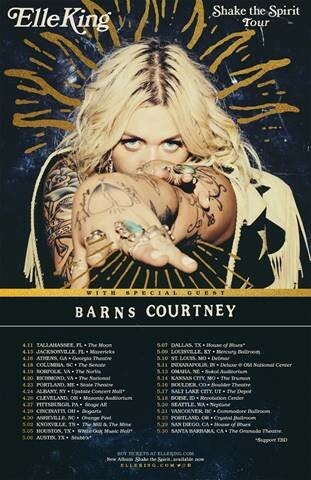 [New York – January 14, 2019] Multiple Grammy-nominated and platinum-selling recording artist Elle King today announces that she’s adding more dates in 2019 to her “Shake The Spirit” Tour, kicking off April 11, 2019 in Tallahassee, Florida and running through May. Special guest Barns Courtney will join on the more than 30 city run. Tickets and VIP packages go on sale Friday, January 18th at 10 am Local Time. Visit www.elleking.com for more details. More tour dates to be announced soon. Elle’s brand new single “Baby Outlaw” debuted #1 most added on the AAA chart and is currently Top 20 on the chart. Watch her performance of “Baby Outlaw” The Late Late Show with James Corden HERE. Elle King’s second studio album SHAKE THE SPIRIT was released in the fall of 2018 to critical acclaim and massive radio success. Lead single “Shame” topped the Triple A Radio chart at #1 for two consecutive weeks, and with her fourth radio #1 single “Shame,” Elle became the only act in history to have scored #1s on all 4 radio formats. READ the Billboard chart story here. She celebrated the record-breaking news with her fans on Instagram. King performed “Shame” on Good Morning America with an interview with Robin Roberts, Nightline, Live with Kelly and Ryan, and The Late Show with Stephen Colbert. Jon Pareles of The New York Times describes Elle as “a sassy, hard-drinking, love-’em-and-leave-’em hellion with bad tattoos and a broad pedigree across rock, pop and country. She has Adele’s determination and Joan Jett’s stomp, Brenda Lee’s high-voiced bite and some AC/DC shriek.” The Kansas City Star also wrote: “riveting… King growled like the rockabilly pioneer Wanda Jackson…and evoked the R&B great Etta James.” Her debut album Love Stuff, a sultry, badass mix of rock and roll, blues, and country, with a twinge of pop, was released in February 2015. Her breakthrough single “Ex’s & Oh’s,” propelled Elle into the mainstream spotlight, and earned her two Grammy nominations and was certified double platinum. The track, about leaving behind a string of brokenhearted exes, hit No. 1 on Billboard’s Hot Rock Songs Chart, and topped the AAA, Hot AC, and Alternative Radio charts, leading King to become the second female artist in 18 years to reach No. 1 at the latter format. She was also featured on Dierks Bentley’s Grammy-nominated No. 1 Country Airplay hit “Different For Girls” (she performed it with Bentley at the CMA Awards and took home an award for “Musical Event of the Year”). King also performed for President Obama in honor of Mavis Staples at the 2016 Kennedy Center Honors.